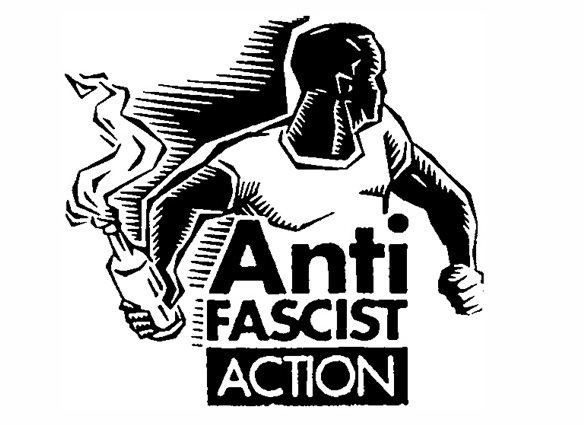 A brief history of Anti-Fascist Action (AFA), which fought a secret war against the far right in Britain and drove them off the streets. AFA was originally set up in 1985 as a broad front anti-fascist organisation. The main fascist organisation at this time, following the demise of the National Front after Thatcher took power in 1979, was the British National Party (BNP), a more extreme split from the NF. Militant physical force anti-fascism has a long tradition in Britain - going back to the 1930's, the 'Battle of Cable Street' and the 43 Group in London's East End, and it was in this tradition that AFA was formed. Wherever fascists were unopposed, they carried out campaigns of violence against ethnic minorities and working class organisations. Taking Liverpool as an example, the few attempts by the BNP or NF to hold public marches or meetings in the city centre during the 1980's had been smashed into the ground by a large turn out from locals - notably from the Liverpool black community . This failure of big events, however, didn't stop the BNP selling papers openly in the town centre on a regular basis, unopposed. This also didn't stop them starting a campaign of violence against left wing targets - in particular against the bookshop 'News From Nowhere', run by a feminist collective. After a few almost-successful attempts to burn the bookshop down, the windows being smashed in on Saturday daytime attacks - probably after a paper sale - and fascists generally strutting into the bookshop to intimidate staff and customers as and when they pleased, it was obvious something had to be done. Other fascist attacks at the time included smashing the windows of the Wirral Trades Council (over the water from Liverpool). BNP local activity like this, coupled with racist and homophobic attacks, was typical in any area in Britain where they were left unchallenged. AFA was launched in Liverpool in 1986. At that time, Militant (now the Socialist Party) was still the strongest working class group on the left. Neither they nor the Socialist Workers Party (SWP) were interested in being organisationally part of AFA, though both turned out in the event of fascist marches. From an early stage the main organisers of Liverpool AFA were associated with the local anarchist scene. Liverpool AFA was mostly anarchist - but it was never an anarchist front or a recruiting tool, except by way of natural influence. Anyone who agreed with the 'physical and ideological opposition to fascism' could be involved, and many did. Links were made with trade unions, Jewish and other anti-racist groups, and meetings were held to attract wider participation. Anti-fascists at the two universities also set up AFA groups at this time - a process repeated several times as students came and went. Within a year or so, the Liverpool BNP went from boasting about how the 'reds' were always beaten in Liverpool when they tried to force the BNP off the streets (according to confiscated copies of the 'British Nationalist'), to the effective collapse of the group. Years later, the BNP admitted in the Liverpool Echo that "they were driven underground by left wing extremists in the mid-80s" [Oct 1993]. This kind of effective shut-down of BNP groups - by any means necessary - was also typical of AFA in this period. Nationally, meanwhile, the original AFA had collapsed due to incompatible political differences. Local and Regional groups (like the Northern Network) however continued, and national call-outs still occurred using existing contacts. AFA was re- launched in London in 1989, and in 1992 a national meeting was held in London to sort out a new national structure. The re-launch of AFA was as a militant 'united front' - an alliance of different political tendencies - orientated towards the working class, to reclaim working class areas then claimed by fascists as their own. The class perspective was agreed because, first, fascists don't just play the race card - they address genuine fears of the white working class (unemployment, bad housing etc.) and their success was often based on disillusionment with so-called 'socialist' councils. This propaganda needed a class-based answer. Second, it wasn't enough to 'defend democracy' - if AFA didn't say the system needed to be smashed, that would leave fascism as the 'radical' alternative. Third, the aim of fascism is the utter destruction of working class power, and so only the working class have a stake in opposing it. AFA, it was agreed, wasn't interested in 'allies' that were part of the problem such as corrupt councillors. Links, it was agreed, would continue to be made with black and asian communities under attack, but AFA propaganda should be mainly aimed at the communities where fascists themselves aimed to recruit . Organisationally, it was agreed that AFA would be a decentralised federation based on a regional structure - building from the existing regions of London AFA and the Northern Network. The only national structure was to be a national coordinating committee of two delegates per region, to meet as and when needed, with no powers to make policy (or certainly to impose policy - some minor national decisions did have to be made over these years, but these were non-controversial). London AFA at that time was mostly run by the Marxist Red Action - in alliance with elements of the anarcho-syndicalist Direct Action Movement (DAM), and the Trotskyist Workers Power. There were also non-aligned independents - anarchists and other socialists - involved. The Northern Network (originally the Northern Anti-Fascist Network) was a looser federation of Northern AFA groups - Bolton, Liverpool, Manchester , Leeds, South Yorks, Tyne and Wear, Preston , and others. Tyne and Wear were actually a Council-funded body set up before AFA. Of the rest, Manchester were run mainly by Red Action (probably the strongest Red Action branch outside of London); a few groups - like York - would probably be best described as "non-aligned" independents. The rest were mainly organised by anarchists - sometimes in the DAM, sometimes not. The DAM didn't officially prioritise anti-fascism - many or most of the DAM were trade union activists or shop stewards - though some anarchist groups definitely prioritised the anti-fascist fight more than others. AFA at its height consisted of far more than its activist core, and far more than just its street fighters. AFA activism involved public speaking, magazine and pamphlet production, organising fund-raisers (gigs, carnivals), etc. A lot of people put time and effort into AFA-related activities who agreed with the aims, but weren't particularly involved organisationally or in going to meetings. At this time there was a working - and productive - relationship between the anti-fascist magazine 'Searchlight' and AFA, partly because AFA was the only game in town. At a regional and national level, AFA actions were mainly based around countering known - or intelligence-indicated - fascist mobilisations. Remembrance Sunday in London was the first national focus point in 1986 - the National Front having made a point of marching to the Cenotaph on the day, then attacking left wing targets - notably the anti-Apartheid picket outside the South African Embassy. These militant AFA mobilisations had the desired effect - the fascists were stopped. In the North, meanwhile, the Northern Network mobilised against the BNP's Remembrance Sunday meetings at Clifford's Tower, York. The BNP chose Clifford's Tower as it was the site where many of York's Jewish community were burned to death in the middle ages. Some of these early AFA mobilisations to York were relatively open, and quite large. In 1988, for instance, Liverpool AFA took a full coach and minibus - over 80 people - to the event, though on that occasion they were stopped on the outskirts of York and escorted all the way back to Liverpool by the police (the same happened to a coach from Newcastle). Echoes of police tactics in the Miner's Strike of 1984-85… Later mobilisations tended to use just mini-buses. Again, after a few years, AFA tactics were successful. Remembrance Sunday was only one day - many other AFA mobilisations occurred, in many parts of the country, over these years. This was especially so as new AFA groups were formed and new AFA Regions were organised. Tactics evolved and were constantly under review. A typical 'event' in the North would involve a call-out after intelligence indicated fascist activity – e.g. a BNP election leafleting would be taking place (mobilisations weren't just about marches). AFA would meet, send out scouts, and act according to intelligence gathered on the day. Sometimes AFA leafleting of estates was not just to counter fascist propaganda, but also to provide a legal excuse for being there. As time went on, in the Northern Network (London AFA operated very differently), each local group elected a delegate during mobilisations. Delegates from each group got together on the day and coordinated events. Usually, but not always, the unofficial 'chief steward' was the one in whose backyard the nazi mobilisation had occurred. Coordination was more based on informal working relationships and trust rather than any official positions, and once the fascists were located, what happened next had more to do with personal initiative and 'bottle' than a 'commander'. In London, Blood and Honour - the nazi record label and music front - was beaten off the streets in 1989 when they tried to organise publicly. In 1991 an AFA Unity Carnival in London - attended by 10,000 in September - was followed on Remembrance Sunday by a 4,000 strong confrontational 'National Demonstration Against Racist Attacks' through the East End. From reacting to the fascists, AFA was seizing the initiative. This was the biggest anti-fascist demo in years - AFA seemed on the verge of some kind of breakthrough. Instead, seeing the way the wind was blowing, within months the SWP had re-launched the Anti-Nazi League (a very different animal to the original militant ANL of the 1970's ), Militant launched Youth Against Racism in Europe, and Black Nationalists in the Labour Party launched the Anti-Racist Alliance 6]. The end result of this was that, while these new organisations brought in new faces, anti-fascist unity had suddenly become a competitive market place, with organisations which were better funded, and better-connected in terms of media publicity than AFA. AFA did continue to help organise and provide stewards for specific broader anti-racist marches - such as the 1992 'National Demonstration Against Racist Murders'  - but there were no more AFA marches. By 1993, in big national anti-fascist marches, like the marches to the BNP headquarters in Welling, organised by all the 'big names' - the biggest being of 40,000 in September 1993 - AFA activists either organised separately to track down any BNP groups ( e.g. London) or joined the march (e.g. Liverpool). AFA carnivals did still continue. A rained-on Unity Carnival in London in September 1992 provided a useful recruiting ground for the 'Battle of Waterloo' a week later - when Blood and Honour were smashed off the streets again, by over 1,000 anti-fascists organised around AFA. The last big AFA carnival was in Newcastle in June 1993, with 10,000 taking part. In London, in January 1994, an AFA national mobilisation humiliated another attempt by neo-nazis to go public - this time by paramilitary group Combat 18. Other areas AFA was involved in included Cable Street Beat - inspired by the Rock Against Racism of the original (1970's) ANL, to promote anti-fascism through music. Freedom of Movement was set up later - based in Manchester - to further this idea in the clubbing scene. Other AFA campaigns were launched to promote anti-fascism at football grounds - starting with Leeds, and later Newcastle, Manchester, Glasgow , etc. A national AFA magazine - 'Fighting Talk' - was produced, and the AFA profile was also raised by a BBC 'Open Space' programme about the group. The 'united front' where activists worked together started to break down as the 1990s progressed. The relationship with Searchlight started to turn sour. Anarchists had not trusted Searchlight since at least the early 1980's - when articles in anarchist papers examined Searchlight's then editor Gerry Gable's links with Special Branch (alleging a 'something for something' relationship – i.e. Searchlight would give details to the State, and not just about fascists). In 1993 Searchlight ran a smear campaign against anarchists - in particular against specific DAM and Class War members - alleging they were really fascists. This probably wasn't a coincidence now there were alternatives to AFA to back. From the mid-1990's Red Action - who had previously had a very close relationship with Searchlight - began more and more to take the line that association with Searchlight was becoming a liability - with Searchlight increasingly providing misinformation and trying to manipulate AFA for its own agenda . Relationships between Red Action and anarchists also began to break down. In London , state interest in Red Action at this time seemed more than just paranoia, and anarchists were obviously being kept out of the loop. Workers Power left for the ANL, many independents left, and, increasingly, London AFA was moving from an alliance run mainly by Red Action, to one consisting more or less exclusively of Red Action. In Glasgow - around late 1992 - relationships between anarchists and Glasgow Red Action deteriorated to the extent that anarchists felt compelled to organise a separate meeting. At least two anarchists leaving the meeting were physically attacked by Red Action members. One of the organisers of the meeting - a committed anti-fascist of long standing - was later falsely smeared as a police grass in Red Action's paper 'Red Action' . The main contribution to the united front breaking down, however, became the pushing of a new Red Action strategy: creating a new political party - the Independent Working Class Association (IWCA) - around 1995. The IWCA didn't come from nowhere. A turning point, as far as London Red Action goes, was the election of a BNP councillor - Derek Beacon - in the Isle of Dogs, London, in 1993. As was said at the time, London AFA felt they had nothing to offer people apart form 'don't vote BNP', which in the circumstances, Red Action felt, could only have meant vote Labour or Liberal Democrat - the very people who'd helped create the housing problems in the Isle of Dogs in the first place. Red Action had always been a strong supporter of the Irish Republican movement - and the move of Republicans from the armed struggle towards community organising, and the electoral success of Sinn Fein, may well have also played a role in the re-thinking of Red Action's strategy. When Red Action started pushing forward the idea of the IWCA, articles were written, circulars sent out, and a meeting held in the North in late 1995 where London Red Action put forward their case. The argument was basically 'if not us, who?' was to fill the political vacuum created on the left by Labour abandoning the working class on the one hand, and AFA's success in beating the fascists on the right. The BNP were moving from the 'battle of the streets' (which they'd lost) to a EuroNationalist/community activist  strategy. AFA, it was stated, would have to adapt. This wasn't billed as a decision-making meeting. No vote was taken, but from then on Red Action argued that there was a 'mandate' - that there was a 'consensus' in AFA to officially back the IWCA - despite the Northern Network voting against official backing. This position was backed by London's control of 'Fighting Talk' . As was said at the time, many AFA activists already had wider political commitments and they argued that why should a united front organisation like AFA prioritise any particular working class party in an election? After all, AFA was open for SLP and other party supporters to join - and many AFA activists were against electoralism as a strategy anyway. The IWCA down-playing of the workplace as an area of struggle also came at the time when 500 Liverpool Dockers had been locked out and solidarity actions were occurring all over the world (most notably among USA longshoremen and in Australia) during a struggle lasting over 2 years. The IWCA was being pushed as a way to stop AFA stagnating as the BNP abandoned the battle for the streets. In reality, the struggle for the party political line alienated much of the AFA core and periphery - in undermining the united front it became a factor in the decline it was stated to prevent. After 1995, some anti-fascist mobilisations did still occur i e.g. against the NF in Dover in 1997 and 1998. Internally, a new AFA National Coordinating Committee was set up in 1997. From the way this was used it is clear that this Committee actually had powers - a far cry from the old national committee – an indication of how few anarchists were still involved organisationally, and how far the Northern Network had declined. In 1997 an AFA statement officially banned members from associating with Searchlight - and, in 1998, Leeds and Huddersfield AFA were expelled by the new Committee, officially for ignoring this policy. Expulsions didn't stop the decline. There were some local re-launches – e.g. Liverpool in 2000. But by 2001 - though probably a long time before - AFA as a national organisation hardly existed. - street fight, arrests and injuries from the war of attrition and a ageing activists with increasing family commitments taking their toll as the income of new members slowed. Some former elements from AFA regrouped to form militant anti-fascist group No Platform in 2002 and others later in Antifa in 2004. Antifa, largely dominated by anarchists, has imitated AFA's stance of physical and ideological confrontation with fascists and has a policy of non-co-operation with Searchlight or any other state-linked agencies. The IWCA continues to run for election in certain areas and has a small number of councillors. The bulk of this text was from an article, Anti-Fascist Action - an Anarchist perspective, by an ex-Liverpool and Northern Network AFA member written in February 2005 for Black Flag magazine. It mostly took a Northern angle and was run past other ex-AFA members - from Liverpool and elsewhere - to cross-check the facts and provide feedback. The text was heavily edited by libcom.org in 2006 to shorten it, remove the first-person writing style, remove some analysis and opinion and remove some footnotes. The Offshoots section was also added. The original article will soon be available in the libcom.org library. 1. Eg attempted fascist meetings in the Adelphi Hotel and St. George's Hotel. 2. Information taken from the Liverpool AFA minutes of the national meeting - these were a lot more detailed than the official minutes. 3. DAM abolished itself and launched the Solidarity Federation in 1994 - the aim being to build a class organisation based on anarcho-syndicalist principles - based on industrial and community networks - rather than being just a political grouping of anarcho-syndicalists (see http://www.direct-action.org.uk/ ). Not all DAM members - including some of the most active anti- fascists - joined the new organisation. For a brief overview of some of the events in London AFA during these years, from a DAM member's perspective, see the pamphlet "Bash the Fash - Anti-Fascist Recollections 1984-93", K.Bullstreet. Published by Kate Sharpley Library, BM Hurricane London, WC1N 3XX. 4. Scotland existed as a Region probably since 1993. In 1994 the Midlands Region was launched and moves were begun to launch a Southern Region. The AFA public contact list in 1996 (as shown in Fighting Talk) had 12 groups listed in the North, 12 in the South (including London), 4 in the Midlands, 3 in Scotland, and 1 in Wales. There were quite a number of groups not in the list – e.g. Doncaster, Chesterfield, and Mansfield. Groups also varied in terms of numbers and resources, and were often contacts for a much wider area (i.e. you really need to know the background) but this still gives a rough idea about where AFA's strength lay at this time. 5. For a comparison of the old and new ANL, see "The Anti-Nazi League A Critical Examination 1977-81/2 and 1992-95". Originally published by the Colin Roach Centre in 1996, it can be read at http://www.red-star-research.org.uk/rpm/anl.html . 7. November 1992, Eltham, London. The march was held under the banner of the 'Rohit Duggal Family Campaign'. 16 year old Rohit Duggal was murdered in July 1992 in a racist attack. 8. Some people called this 'Waterloo 2' - though it wasn't anywhere near as public. Combat 18 (18 standing for AH i as in Adolf Hitler) was the short-lived organisation of nazi 'hard men' and would-be terrorists designed to take on AFA and others, and used to provide security for the BNP. C18 eventually disintegrated. The history of C18 is quite convoluted and bizarre, so will not be explained in detail here. 9. Various articles in anarchist papers and magazines. Also New Statesman, 15.02.1980. 10. See various articles on the Red Action web site www.redaction.org. Also various 'Fighting Talk's. Whatever the reasons, it's clear there was a breakdown in the Searchlight-Red Action relationship. 11. Information re-confirmed recently  by a then member of Glasgow DAM, and by a contact in Liverpool. Looking back, the Glasgow Red Action attack on anarchists wasn't really dealt with properly - either within AFA or the wider anarchist movement. As it was, the incident caused a lot of bad blood nationally, but AFA held together. 12. "EuroNationalist" meaning a strategy similar to Le Pen's National Front in France - rather than a 'march and grow' storm trooper traditional nazi approach. 'March and grow' in Britain had by now become a lot closer to 'march and die'. 13. Liverpool AFA sent out a statement nationally - soon after London Red Action's meeting, arguing against AFA becoming the physical wing or part of any political party or organisation. This statement was provisionally adopted at the next Northern Network meeting, pending further debate. 14. Fighting Talk (Nov 1995) stated that the Northern Network supported the IWCA, and printed an IWCA recruitment article. This was never updated. AFA groups were sent IWCA leaflets with 'AFA' on as sponsors. To keep things brief - the way things happened could, perhaps, have been due to a genuine misunderstanding of how the Northern Network operated. It came across as railroading - to put it mildly. It could certainly have been handled better. No Retreat: The secret war between Britain's Anti-Fascists and the Far Right. Dave Hann and Steve Tilzey.Milo Books. It's important to stand for what you believe. An example of active anti fascist action can be seen with the Battle of Cable Street in London 1936. Here's a link to a film which explains just what happened and how ordainary locals stood up and protested against a large fascist group and the police. I believe an AFA autobiography is currently being put together I am wondering if this is part of the same project. Is this artcle in the library? Interesting article. And interesting comments too. If there is a history of AFA being written, I know several people who would be interested in contributing here in Leeds. Couple of points: the Leeds AFA group was most certainly not DAM led, though we had positive relations with them. The core group consisted of non-aligned socialists, a couple of anarchists, a couple of people with unspecified general politics and the secretary of the trades council. Alongside DAM we also had links and positive relationships with the CP, the trades council, the various Trotskyist groups, and a couple of anti racist educational organisations, a whole lot of unaligned individuals, including an ex-NF member.! My memory of the SWPs involvement was to deny that fascists were posing any great threat at that time and to belittle the campaign, until they were ready to launch their own campaign. The Leeds group focused a lot of its energy around Leeds United and Elland Road, and set up Leeds United Fans Against Racism and Fascism (that might not have been its name but something like that),and the group went on to make very substantial headway in tackling racism in the club and on the terraces. I seem to remember them winning some kind of award for the work they'd done but I'd stopped being actively involved by that time. All in all, it was an organisation with lots of inbuilt problems (very little links with Black communities for instance, and and not entirely free of a certain amount of misogyny, let's say, but I'm never the less proud to have been part of a front line fight against racism and fascism in my city.